Gyaltsen Norbu, 11th Panchen Lama chosen by Beijing in 1995. (TibetanReview.net, Jun21, 2015) – Following a Jun 10 summon by China’s President Xi Jinping to the Zhongnanhai, the headquarters of the Communist Party of China Central Committee, the replacement 11th Panchen Lama chosen by Beijing in 1995 has issued more strident calls on the Tibetan Buddhist monasteries. Addressing the 11th meeting of the Standing Committee of the 12th National CPPCC, whose supposed role is to advice the national parliament, Gyaltsen Norbu has called for strict management and education systems in monasteries, and said “it is especially important to strictly deal with social chaos in religious circle according to the law,” reported China’s online Tibet news service eng.tibet.cn Jun 19. 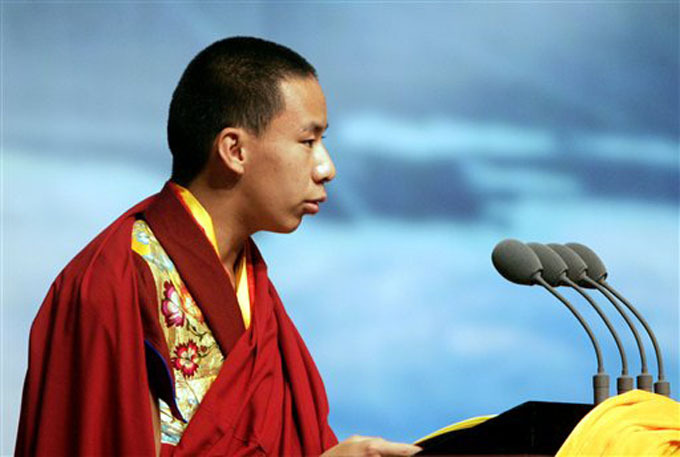 The report noted that during the Jun 10 meeting with Xi, Gyaltsen had promised to contribute to the adaption of Tibetan Buddhism to the socialist society as well as peace and stability in Tibet. The report emphasized that adapting religion to the socialist society should be manifested mainly in three aspects, with the first one being to love the motherland, uphold the socialist system, support the leadership of the Communist Party of China, and support the laws and regulations of the motherland and its guiding principles. The report did not bother to say what the remaining two aspects were, unless included in the above.